First of all it’s a metal two pieces case with bights to receive the watch strap. 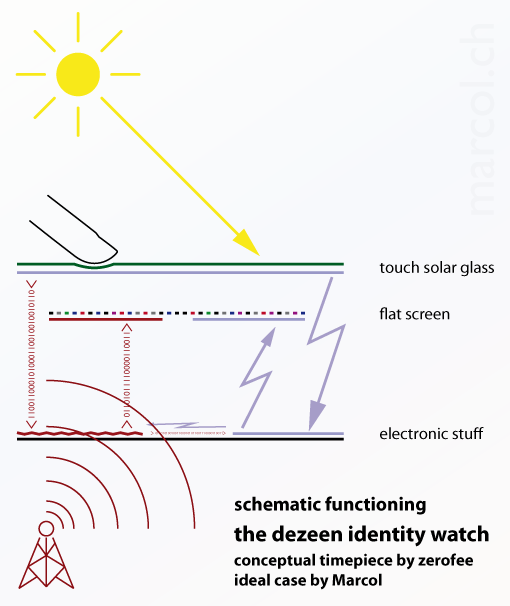 On the top is a transparent touch glass with solar cells (like the Tissot touch watch and the Qin Hua cell). This glass is connected to the bottom electronic stage where there is a lithium-polymer (li-po) battery and the computer. Under the glass is the color flat screen where the apps can be shown. On the bottom is the electronical stage with a radio receiver to have a remote controlled hour indication from an atomic clock (like the PTB one) and the li-po battery. On the back of the electronical stage is five buttons. One for the reset (sometimes is good to reboot the system…), three for hours, minutes and seconds if you are in the wild without a radio time signal, and a last for radio controlled receiver control. Each component (case, strap, glass, screen, electronic box) can be changed if broken or for upgrading. Of course color and material of the case and the strap can be personalized. 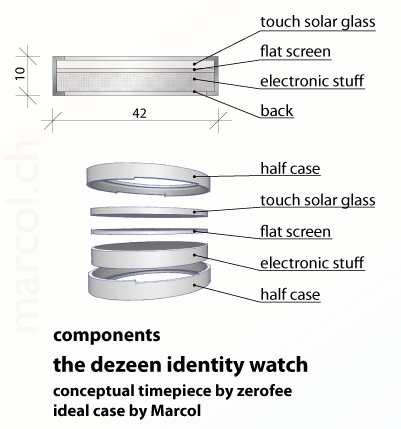 All in all it’s an ecological, eternal, multipurpose and needleless watch.